AS REFLECTED IN OUR INTRODUCTION, Ted Juracsik of Tibor Reels takes pride in a no-nonsense approach to building quality fly reels. In the past, the company focused their attention primarily on high-end saltwater reels (with the notable exception of the Tibor Light). But in 2009 they’ll be setting their sights on the steelhead/salmon market with their new “Tibor Spey” model, an elegantly engraved reel with a moss finish and a perfect fit for the two-handed market. For the first time Tibor will also add helpful “witness marks” around the drag knob to aid in consistent drag setting. The Tibor Spey will retail for $860 ($430 for extra spools). A larger arbor freshwater reel from Tibor is a welcome sight, and we hope it’s the beginning of more innovation from them on the non-salt side. Sage has revamped their entire fly reels line for 2009, and will introduce 8 new reel families encompassing 27 different models. The idea, in Sage’s mind, is to have reels matched to each fly rod in their entire line. First is the saltwater 6000 series, a $700 fully machined reel in sizes 8, 10, and 12; the 4500 series replaces the 2500 series and has more porting to make it lighter (don’t worry, 2500 spools will still fit it); the 4500 CF uses carbon fiber spools, pulling some weight and cost out of the 4500; the smaller 3800 series also uses carbon fiber spools; Sage replaced the old click and pawl reels with the new “insanely light” Click models; and finally, for lightweight applications, they are offering the 2000 ($150), 1800 ($125), 1600 ($99) series. All the new carbon-spooled reels have a distinctive look, and the new engineering and increased porting in higher-end models are pleasing improvements. Ross Reels was hard at work in 2008 on developing several new reel components. The highlight of those efforts will arrive in November in the form of a the new Vexsis series of reels, designed for 3-, 4-, 5-, 6-, and 8-weight lines ($245-305). When you pick up the Vexsis, the first thing you notice is the unique concave design of the frame and spool — a feature that allowed Ross to add more porting and remove material without compromising strength. (The smallest Vexsis weighs only 4.5 ounces, the largest 6.0 oz.) The second interesting feature is the new magnetic spool release; simply pulling on the spool after depressing a small button will remove it, and sliding it back onto the center pin locks it securely in place. Ross has also engineered an effortless drag knob rotation system based on a multi-ball thrust bearing. And a quick flip of the escapement cover allows conversion from right- to left-hand or vice versa. 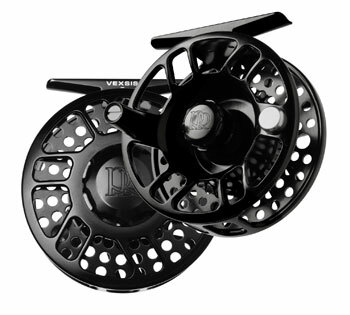 Ross will offer the reels in three colors: Black, Copper, and Gray Mist. All these features and an aesthetically very pleasing design earn the Vexsis a MidCurrent “Best of Show” for 2008. Ross will also introduce three more new reels in November. The Momentum LT ($445-645) is a lighter version of the Momentum big game reel and comes in 5 sizes, for line sizes 6 through 12. The only real difference between the LT and the heavier Momentum is the porting, with much more material taken out of the new version. In the Ross Worldwide line, the new Airius fly reel ($190-240) offers a fully machined and anodized 6061-T6 frame and spool at a very good price. And the new value-priced Flyrise ( $95-110), which replaces the Flywater series, is a pressure-fed cast reel which uses the same proven drag system as the Rhythm series. This year Abel directed research toward building a bullet-proof quick release mechanism for their Super Series spools. We tried the new Abel QC or “Quick Change” (to be available first for the 7/8 with a 9/10 and 11/12 to follow) at the show and found it to be one of the most elegant designs of a quick-release system we’ve seen for big reels. Push in and rotate the reel’s center cap and the spool slides right off; re-attaching the spool is just as simple. 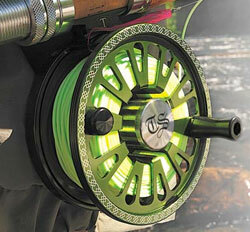 The spool will be available on any new Super Series reel and adds $50 to the reel price. By the way, Abel will be consolidating the Big Game series into the Super Series beginning in 2009. The frames were more or less the same, but the Big Game series featured larger arbors; now you’ll be able to get any Super Series reel with a large-arbor spool. Finally, Abel is continuing their tradition of artist-inspired engraved reels. We saw a very attractive limited edition “Redfish” reel engraved with the work of Tim Borski at the show. Hardy and Grey’s really got our attention in Denver by showing us their brand new 2009 version of the 1923 model Hardy Perfect reel. The new reel is identical to the one produced 86 years ago except that now the reel is CNC-machined and the brass foot has been replaced with aluminum. Hold one of these little gems in your hand and you will know immediately why the design remains relevant: it is very light and simple, but excellent engineering makes it a reliable performer. And it sports a classic look that makes it a handsome piece of gear even in the 21st century. Did we mention that we want one? Hardy is also bringing over the Angel 2 reel ($399-499), competing head on with U.S. makers in the mid-priced hard-anodized reel market. Meanwhile Grey’s is offering an entirely new version of their popular GRX and GRXi fly reels called the GRXi+ ($99-140). These new reels offer a greatly upgraded die-cast alloy cage and new twin Rulon disc drag system. Grey’s also has a new X-Flite reel, designed to match their X-Flite Rod series. Die cast and with a 3-pillar design similar to the GRXi+, the X-Flite reel features a fully machined bar stock face plate and is priced from $150 to $200. Exclusive Reels, seller of Ari Hart reels in the U.S. has a brand new line of reels for 2009 coming out under the new Halo brand. The first Halo reels, manufactured in Canada, will be available in 3 sizes: ERV 5/6 ($549), ERS 7/8/9 ($669), and ERZ 10/11 ($799). The new Halos feature a cork disk drag, left- and right-hand conversion, and “Level 3” navy-grade anodization. It will be very interesting to see whether the company’s association with the “reel as a work of art” will translate into high-end reel sales for their first manufactured product. This year Orvis began offering a larger version of its popular Battenkill Large Arbor reel. The Battenkill Large Arbor VI is made for 11-13-weight lines retails for $249. Orvis also will also introduce an improved version of its VO2 reel in November ($350-425). The new VO2, which places the cork drag surface around the outer radius of the reel, promises 25% more drag surface and stopping power than the previous design. 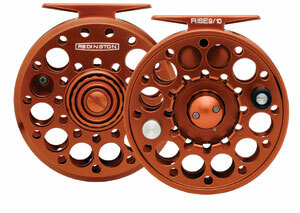 Redington will introduce 12 new fully machined 6061-T6 anodized “mid-arbor” model reels in 2009. The new Rise series ($149-179) utilizes a Koyo™ one-way clutch and ceramic-coated bearing and a cork-on-Teflon drag system. Rise reels will be available in four sizes for 3- through 10-weight lines and in three colors: Moss, Burnt Orange and Dark Charcoal. These new reels follow a trend we saw really taking hold for ’09: aggressive porting and materials reduction to reduce weight. Hatch Outdoors continues to make improvements in what is certainly among the most carefully engineered line of reels on the market. When asked at the FFR show about the concept behind their multi-layer stacked stainless steel and Rulon drag system, company president John Torok told us they looked more closely at the new technology in offshore reels than traditional fly reels for inspiration. “Every year we tweak the engineering. This year we’re introducing a smoother, more ergodynamic handle.” But the bigger news from Hatch is their new 12+ model, designed for bluewater applications. Hatch Reels range in price from $400 to $750, with the new 12+ — due out November 1 — coming in at $875. Bauer Reels introduces the new Rogue reel for 2009 ($335-595), featuring a carbon fiber composite disc drag and V-Arbor design, which maintains a larger effective diameter for the portion of the fly line and backing that is actually used when fishing. Bauer offers some of the most interesting color options on the market, with striking “Splash” colors available for both spools and reels. 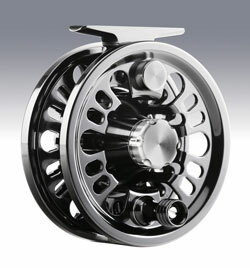 For 2009 Waterworks/Lamson will have several new offerings in fly reels. 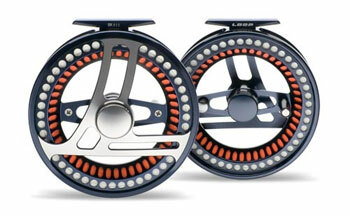 ULA Force FS reels ($529-639) feature a very large spool diameter for super-fast line uptake in saltwater. The big reels employ a scaled-up version of the fully sealed conical drag the company will also use in their new ULA Force LT ($329-459), which weighs only 3.25 oz. The Lamson Litespeed ($279-419) and Lamson Velocity ($229-339) both feature Hard Alox finishes, which the company touts as being much harder than Type 2 anodizing. The Velocity is redesigned for 2009 for better strength-to-weight ratio, line pick-up speed and storage. 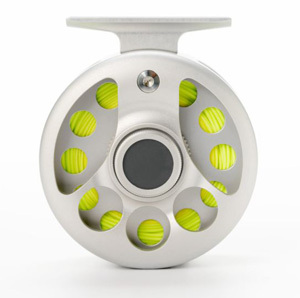 And finally the brand new Guru reel ($179-249) enters the market as the company’s lowest-price fully machined fly reel. The Guru is available in 4-weight through 10-weight sizes and also features a large-arbor design. Swedish tackle design company Loop‘s elegant new Opti Series reel will come in sizes suitable for lines 2 through 12+ (the “Big”) and feature a V-shaped spool design, easy-grip progressive brake knob, and fully anodized aircraft-grade aluminum and stainless steel parts. 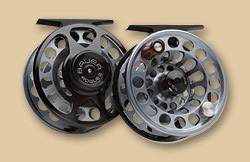 The six reel sizes range in price from $545 (the “Creek” model) to $750 (the “Big). Nautilus has three new products coming to market this year: the Nautilus 12DD, the Feather Weight 1 (FW1), and the NV 5/6. 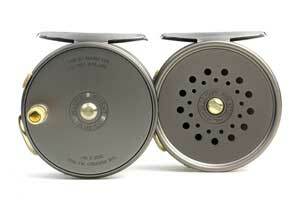 The Nautilus 12 DD (Double Duty) ($550) falls between the 12 and 12T in size and weighs a mere 10.2 oz. The FW1 is the ideal match for a 1- through 3-weight creek rod and features a sealed carbon fiber drag. Nautilus claims their new mid-range NV 5/6 ($540) is the lightest true large arbor big game reel on the market today, and it uses the same sealed disc drag system as their larger reels.